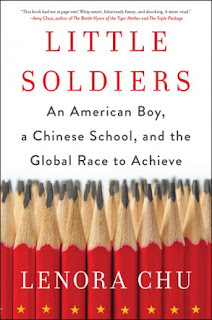 In Little Soldiers, Lenora Chu offers a look into the insular education system of China and uses her parenting journey to launch a wider investigation into whether its educational methods are something to which the West should aspire. 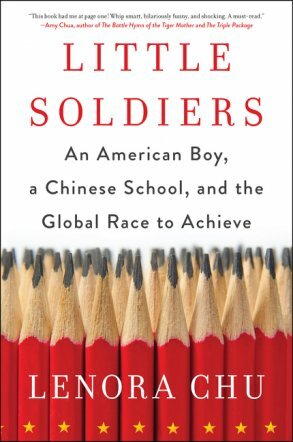 In 2010, Chu found herself at the heart of the global debate between China and the western world when she and her husband enrolled their American son into the Chinese state-run school system celebrated for producing some of the planet's top-ranking students, per the PISA education assessments. Chu writes, "My husband and I relocated from the U.S. to Shanghai in 2010, with our toddler son in tow. Our professional mission was straightforward - we're American journalists, sent over to cover China for an American audience - yet we had our son with us, and we'd be raising a family in China. To my surprise, this little boy turned out to be my entree into one of the world's most revered, and most insular school systems. Few Americans have firsthand experience with China's schools, which is typically described in stereotypes: It's either 'The world's best students,' or 'Rote-learning robots! no creativity!' Through this very intense, personal experience of parenting my son in Shanghai institutions, I had a chance to pull back the curtain on the system." The young family left an American school system fraught with problems, and wanted to set her son on the right path forward. Lenora wondered whether her son Rainey would be better off with an education delivered the Chinese way. Soon after they enrolled him in one of Shanghai's top kindergartens, her spirited toddler began morphing into a proper pupil, and he greeted his teacher with "Laoshi zao!" which means "Good morning Teacher!" and began to emulate the polite, patient behavior of Chinese students. While there were many positives, Lenora noticed troubling signs, such as a habit of obesiance that found its way into everyday life. The deeper she dug, the more disconcerted she became about a classroom environment where very young children are often bribed, shamed, and punished into submission and stripping them of independent expression. Chu writes, "We'd moved across the Pacific Ocean to escape the American parenting rat race, only to land squarely in the Chinese equivalent. I wondered about the contradictions I was sensing: Was the obedience I observed in Rainey part of the Chinese secret to academic success? Were Chinese schools pumping out robots as the critics say, or was China's education system superior? Are Chinese methods what the West should measure itself against, much less emulate?" These questions came up again and again as Chu applied her determination as a parent and her training as a journalist to find larger answers. She befriended Chinese students; interviewed parents, teachers, and experts; visited schools in the United States and China and traveled deep into the Chinese countryside. In her search for answers, she opened a peephole onto a country that seemed formidable from the outside, yet was quietly struggling to make sense of its newfound standing in the world. She uncovers "trade secrets" of Chinese parenting and education, which Americans should consider, such as: Why teachers are revered in Chinese society; why Shanghai kids are several years ahead of American students in math; how a cultural belief in hard work, as opposed to innate talent, gives the Chinese an advantage; why competition can help motivate student achievement; and how China's willingness to learn from other countries, including the U.S., is improving their schools, including how the Chinese are studying how Americans nurture self-esteem and creativity. Chu also reveals the seedy side of the Chinese school system, including: the delicate art of bribing teachers with luxury purses and cash; a military-like, high-stakes system of testing that is killing a love of learning, prompting cheating, and crushing creative expression; posted, public rankings (and shamings) for student scores and teacher performance; China's own "Rust Belt" unrest, and a growing inequality gap as rural kids drop out of school in large numbers.